I could have predicted writing about this topic on my blog. In fact I kind of did see into the future. One of the last topics I came across for my eBook “A Wet Look At Climate Change” was a new piece of technology developed at the Frankfurt Institute in Germany. The scientists at Frankfurt built an instrument running on solar power that removes water from air, turning it into drinkable water. One possible application was to generate a source of water in a desert. I’ll explain how this works below but before I do, let’s think about new discoveries and the technology of “nanomaterials”………..
My prediction was easy and based on knowing just one simple fact about nanomaterials. That is, nanomaterials have a massive surface area. It is hard to imagine but a small amount, say 1g (less than half a teaspoon of salt) can have the same surface area as that of several football pitches put together. 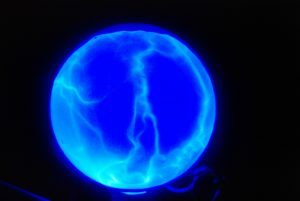 What this large area makes possible is to stick very large amounts of something very small, like a water molecule, onto the surface of the material. 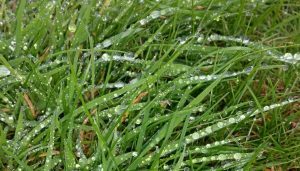 Staying with the football pitch analogy, imagine each blade of grass on just one pitch covered in morning dew, then pool together all the droplets of water on all the blades of grass. You quickly have several litres of water, five to six thousand litres if each blade held just a tenth of a millilitre! Liquid water cannot be compressed, that’s just a physical fact. Several thousand litres of water would take up a very large volume. Using a nanomaterial it may be possible to get a large capacity for water in a relatively small amount of material. Keeping the amount of material low is a necessity for using it in a device that needs to be kept small to reduce the cost for transporting to not easily accessible areas, such as in remote parts of a desert. So the idea is very simple. Use a material that takes up water from the air when you want it to and then releases that water as liquid when you want it to. 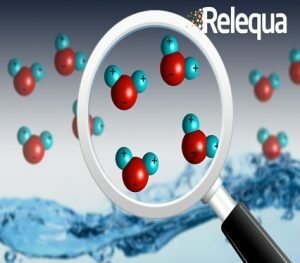 Over the past few years nanomaterials have been developed with the potential for taking up large amounts of water from the air. I’ve picked one of these developments to talk about. Before I do let’s explore the idea, or principle, as to how this way of collecting water works. Two things you need know first. As the temperature of air falls, the relative humidity (%RH) increases. For a more detailed explanation see Chapter 1 of my eBook. The second bit of knowledge needed is that materials take up or lose water from the air depending on the %RH. As the humidity increases, a point is reached where a material takes up water. Linking these two bits of knowledge you can imagine that in a desert at night when the temperature falls the %RH will increase. All we need is a material that responds to this increase in %RH and takes water from the air. Why this can happen is described in Chapter 3 of my eBook. Long before nanomaterials, people in small towns and villages along the Western coasts of Africa and South America have been capturing water using nets. One key thing that’s required is quite dense fog. In coastal regions where the land is very dry and desert like, tall nets supported by poles at each end are erected. Moisture from the fog condenses onto the nets just like water on a spider’s web. Droplets of water on the nets run together and then runs off the nets to be collected in tanks. On the West coast of Africa in the Moroccan town of Sidi Infni, “water mining” has been set up using nets that collect up to 6,300 litres a day. Before having this water available the woman and girls of the village had to walk several miles to collect water from wells. A team of scientists located in The Netherlands, where there is no shortage of water, were working on discovering new materials and came up with a coating material for athlete’s outfits that soaks up sweat but dries very quickly. When applied to cotton they found the coating had an enormous capacity for moisture but released water when warmed to 18-30 degrees centigrade. The coating is a “smart” nanomaterial that responds automatically to different conditions. One of the team, Dr Catarina Esteves, heard about water mining from fog and instantly had the thought of applying their new coated cotton fabric to water capture. 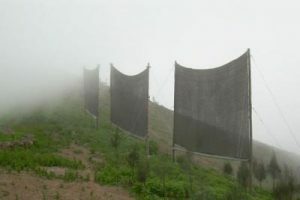 Because their material is “smart” it’s an improvement over the existing nets which rely on very dense fog to cause condensation and a slight breeze to keep the saturated air moving around the nets. The Eindhoven team’s material will capture moisture from the air at lower %RH, naturally and continually, until it reaches its capacity. In Chapter 3 of “A Wet Look At Climate Change” I talk about a phenomenon called Equilibrium Relative Humidity (ERH). This is a natural tendency for materials to adsorb and release moisture depending on the surrounding %RH. In essence what the Einhoven team have done is to create a fabric that in the cooler conditions of mist that comes down to ground level, the material’s physical structure changes so that it’s ERH is lowered. When the ERH is below the %RH of the air, moisture is absorbed. As the material warms up in daytime, as the mist lifts off the land, its structure again changes and raises its ERH to above the daytime %RH, causing the captured moisture to be released. The link above to the webpage describing the Eidhoven team’s idea for water mining is from May this year (second article down on the page if you follow the link). At that time, Dr Esteves said that they are still at the experimental stage with this application. With climate change moving moisture around our planet, flooding new areas and creating deserts in others, applications of new nanomaterials, like water mining, may be very important, if not vital, for survival of our populations in drought affected regions.